In addition to my regular post, this week I'm also cohosting Fabulous Friday with Jennie from A Pocketful of Polka Dots. Keep scrolling to link up, if you haven't visited Jennie's blog yet! Watch out for separation anxiety, followed by the "terrible twos"
What I never did hear, though, was how tough it was to be the parents of adult children. You can see them (metaphorically) heading toward a train, but are powerless to do anything about it. The only things you can do are pray, help pick up the pieces, and in rarer instances they may actually consult with you before they head for that train in which case you can give them your best advice. Recently, I was upset about a situation one of my daughter's was in and wishing there was something I could do to fix it. Then I got angry that she'd even gotten herself into the situation. Then I was mad that I was angry! It was at this point that I acknowledged it was her life and her problem and it wouldn't do me any good to become invested in it. So there ya go, a double-edged "tough love" sword, I need to emotionally back off and she needs to solve or overcome her own problems. Like it or not, it's a lesson I'm sure I'll keep coming back to. You may remember in my Style Goals post that I was considering getting a pair of Doc Martens. Those were brown, but then I found the Luana lace up boot in red (although they are a lot more burgundy/berry color IRL). (A word about Dr. Martens boots: I've never owned this brand before. From the moment I put them on, they did not hurt anywhere! I can't even buy athletic shoes that are comfortable! Plus, my orthotics fit into them.) I think I've been successful in upping the "edge factor" with these. Adding to the Docs, I've been seeing cardigans worn as shirts--I was going to give that a go, but my figure wasn't quite up to it, so I did the next best thing. An Eileen Fisher cami was added, I'm calling it good! The Talbots cardigan is a couple of years old, Lucky Brand jeans are new, they were picked up for my latest Dallas trip. Parenting adults is challenging! ★ If you have high-volume, problem feet, you may want to check out Dr. Martens. My favorite pick from last week is Nicole from What Nicole Wore in her Chic Valentine's Day Color Combo. 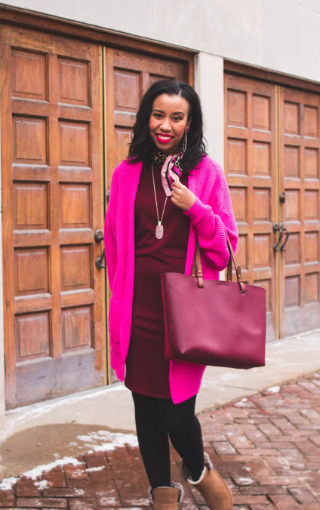 She is a woman after my own heart with this mix of pink and burgundy. Hop over to A Pocket Full of Polka Dots to see Jennie's pick.